Tucked away behind the large grounds of pharma multinational MSD in Oss is a conglomerate of fresh, ambitious life sciences companies united in the Pivot Park campus. Local government took over the redundant buildings after MSD took over the premises, and are leasing the sometimes fully equipped buildings to start ups that need space to grow. One of them is ChemConnection, a young contract research and manufacturing company for nanomedicines and active pharmaceutical ingredients. It was founded three years ago by former IMM graduate Gerjan Kemperman and Ferry Brands, and now has 35 employees. 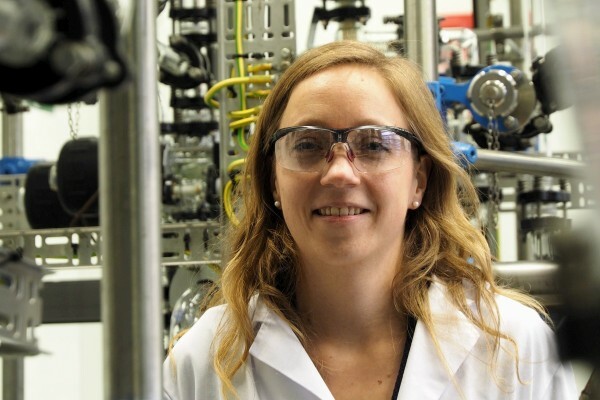 Although Silvie enjoyed her research at the IMM, she decided halfway through her PhD that she wanted to move to industry after graduation. 'I felt that my work was too fundamental and not directly useful to society. I thought I would find a more applied job in industry.' But at the time she graduated, the economic crisis had had its effect and there was a lot of competition for a few jobs. Silvie found that having a PhD was not much of an advantage as the number of jobs for highly educated chemists is not large. To stay up to date, Silvie accepted a postdoc position again within the IMM, doing research for the spin-off company FutureChemistry. There, she synthesised radiolabeled medicines so these can be easily followed in the body. An open application at ChemConnection finally got her the desired position in an industrial environment. Working within the extended environment of the IMM has many advantages, Silvie finds. 'There are so many disciplines represented here, ranging from biology to physics. It is easier to come in contact with scientists from other fields which makes it easier to get out of your own box and look at your subject from a different angle. There are many different collaborations within IMM.' Being a PhD assessor on the board of the IMM, Silvie was able to see the bigger picture clearly. In this position, she was the bridge between the board and the PhD students. She was present during board meetings, and when PhD related issues were discussed, she passed the information on to the students and vice versa.